Explosive, chaotic, and fun. Scrap Galaxy is an arcade-style shooter optimised for local-multiplayer play which revolves around a simple mechanic — modular spaceships. Originally born from an attempt to convert the exceptional Galaxy Trucker board game to a digital form, Scrap Galaxy eventually became a game all about building and destroying ships made of various modular components. Where the board game scores players based on their survival ability, with players gaining the ability to build bigger and better ships between rounds, the game is instead a competitive shooter where proof of quality comes through in combat. The game features a variety of modes, all of which — and this is especially commendable — can be played with AI in place of players, something which is often overlooked in local multiplayer games (Overcooked, Gang Beasts, Samurai Gunn…). Better yet, the AI are competent as well, with the easiest well able to hold its own against completely new players and the most difficult almost completely undefeatable by nascent Scrappers. The game loop is simple; at the start of each match, players pick from a selection of cards, each representing a component. They bolt them onto their ship where applicable. Certain components add new places on the ship to bolt parts on, while others serve as weapons, armour, or buffs. Options exist during set-up to control the number of parts, the time to place them and the number of times a player can undo. Once done with this, players can then take their strange, space-faring monstrosities to the arena. Combat isn’t as simple as it might appear from the screenshots. Different weapon types each have different ranges and there are several ‘fire’ buttons to separate things like the long-charging, short-range, mega-destructive galaxy gun from standard pew-pew lasers. There are a few options for arena style, with size and obstacles available to choose between — asteroids and explosive barrels are among the long list of things you don’t want to career into when you have an exposed generator. That said, separating weapon types does add another level of technique to the game, especially when enemy fire can and will strip components off your vessel. In one match I carefully constructed a layer of armour over the top of a galaxy gun, itself concealing a weapon-power boosting (but extremely volatile) ship generator. I’d built a vessel with a view to out-manoeuvre enemy fire until they had weakened each other, aiming to picking off stragglers once they’d busted through my tough outer shell. Another time I was all guns and boosters, a short-lived attempt to dodge and weave to the exposed areas of enemies and take them out with a barrage. Yet another time I was all lasers, cowering in the corner of the map and firing the extremely-long ranged weapons at enemies from a distance, banking on a lucky shot. I originally crossed paths with Scrap Galaxy while visiting Skövde for the Sweden Games Conference earlier in the year. Developer Jesper Tingvall — self-titled ‘one man army’ of Catalope Games and creator of Skeleton Dance Simulator — showcased the game ahead of the festival, which was set to take place at the end of the week. The near-final build shown at the event only featured deathmatch and co-operative deathmatch, however was completely playable and extremely good fun. 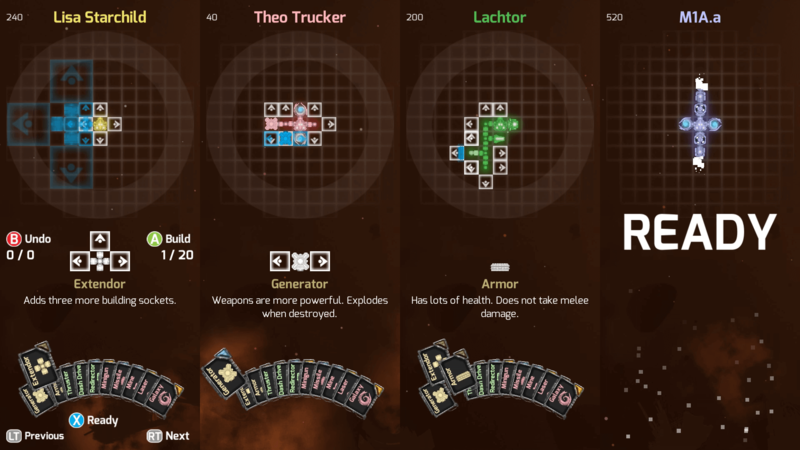 Ahead of this review I secured a final build of the Scrap Galaxy which also included Scrap King mode, as well as fully implemented AI oppositions. While the many options available in deathmatch and co-operative (and think of the tactical options, with one player building an immense space-fortress, and their partner a precise, focused assassin) are outstanding, the real keeper is Scrap King. Scrap King sees the victorious player keeping hold of the ruins of their ship at the end of the round and taking it into the next. This sounds like an overpowered act of imbalance, but it’s actually a massive burden. For a start, the ruins of the ship are not necessarily functional. If you catch a few rockets to starboard and clip one of those previously mentioned explosive space barrels with the stern, then the malformed, disjointed mess of your remains may have no real use other than a few extra connection places and a quarter of your previous round’s guns. That and the fact that you can almost guarantee the three other players will see your situation as an advantageous start will ensure that they’re always keeping their eyes on you. Where Scrap Galaxy could improve, however, is in how easy it is for new players to pick up and play. When the entire group of players are new to the experience, it’s fun. Everybody stumbles over the controls and they all build twisted, mangled ships as they learn — generators exposed to explosives, entire sides unarmoured just waiting for strafes into explosive barrels. But, as you match together a new player with a more experienced one, like a friend introducing a new player, the understanding of the assembly mechanics and the (actually quite in-depth) combinations becomes instantly apparent. A solution to this could involve introducing some pre-fabricated vehicles. This would also add in the potential for set challenges, although that all depends on how easy it is to implement. The only other things Scrap Galaxy is immediately lacking is an ability to play matches for as many rounds as it takes for somebody to meet a score — this will enable players who wipe out multiple opponents in one match to quickly secure an overall win. 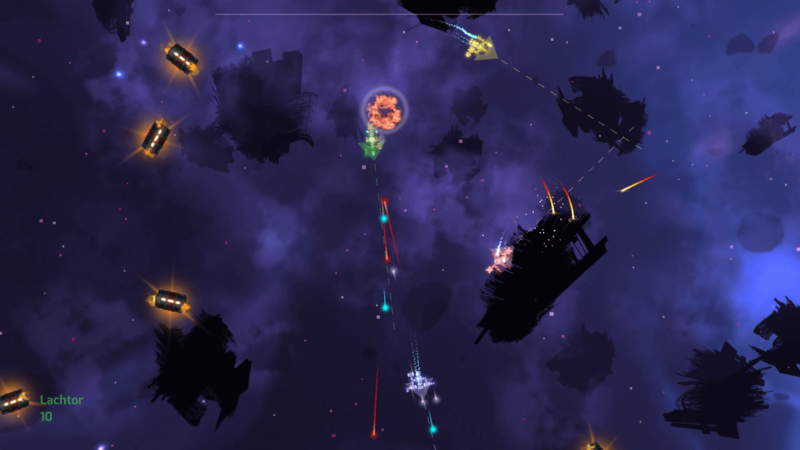 As it stands, Scrap Galaxy is an outstanding local multiplayer with many more options than standard arena-shooters. 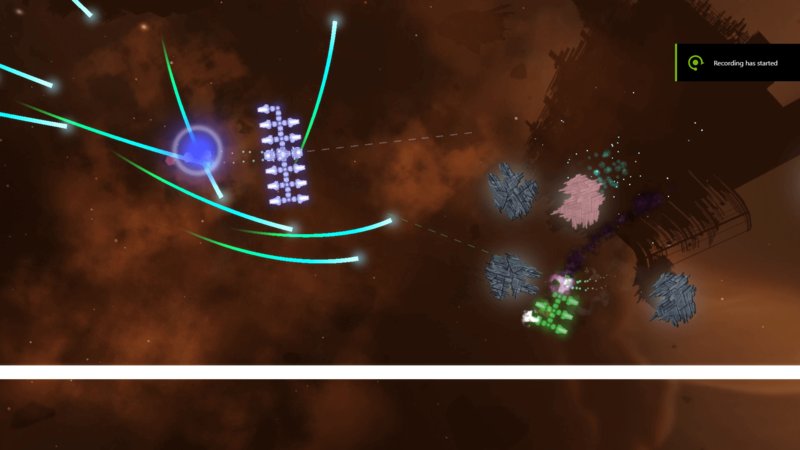 Its options and combinations do mean that the game has a slight learning curve hiding deeper techniques, but AI opponents, plenty of rule customisations and a few mode choices give Scrap Galaxy more than enough content to be accessible.